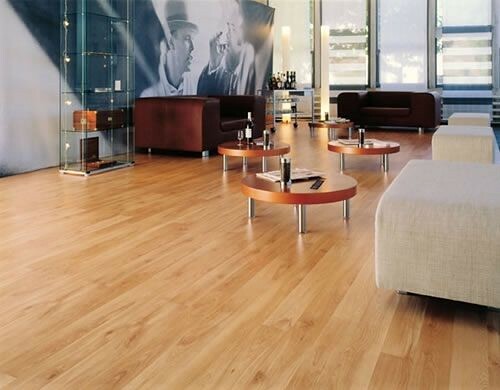 Laminate flooring is widely regarded as the platform of a newly-furnished or modern style home. Laminate flooring has gained popularity in recent years thanks to its clear adaptation and perception of old-style wooden floorboards. Laminate flooring provides a neat and tidy finish that is incredibly simple to lay down. Furthermore, it is capable of working in various different household rooms including the bathroom, bedrooms, kitchens and (in contemporary properties) various reception rooms. Laminate flooring is likely to remain one of the more in-demand types of flooring as it continues to adapt with plenty of colour and style variations becoming available. These variations include colour changing to suit room themes such as grey or white, and a more potent wood finish to bring out an increased authenticity. Real wood flooring is notorious for its hefty prices and often plays second-fiddle to laminate nowadays. However, those who are lucky enough to make the most of their genuine wooden flooring will know that it provides character and beauty wherever it is present in the household. Real wood is quite literally the real deal and provides the authenticity that laminate ultimately cannot. With colour and pattern variations that allow for more exuberance but keep the natural wooden designs, real wood flooring is likely to remain a big hit for many years to come. Vinyl flooring seems to have become more of a necessity than a choice in recent years as it remains the most popular form of flooring for kitchens, bathrooms and conservatories. However, its demand has spilled over to receptions rooms thanks to its newly-modified variations that depict a more dominant setting. Shapes and patterns dominate the various designs on offer, boasting a luxurious finish with sharp colours and original styles that are guaranteed to thrive in the modern household. Most authentic styles don’t come cheap, so those with a smaller budget may decide not to pursue such a charismatic style of flooring. As far as efficiency goes, carpet flooring is up there. However, it’s not just keeping a house cosy that makes carpets as desirable as they are, and are likely to remain. The variations in carpet style, pattern and colour are ever changing, which means there is no issue with regards to choosing a carpet that suits a reception room, bedroom or even a bathroom. Many modern homes now use carpet to depict other more authentic designs, such as wood flooring, meaning carpets are now capable of providing both modern character and household efficiency. Author Colin McD: My wife and I recently moved house, to an older victorian terrace house, which has almost every type of flooring you could imagine! There was laminate in the entrance, wood flooring in the hall and then carpets and vinyl in the lounge and kitchen! While I think we will keep the real wood, a decision needs to be made on the rest!